This is our third trip with Tripsite and this was our least favorite so far. The scenery was not particularly stunning and in France we were on more roads than we would have preferred. We also stayed in larger cities such as Basel and Freiburg than in previous trips. It is a personal preference, but we prefer the smaller towns such as the ones we encountered on our trip from Amsterdam to Brugge and from Prague to Dresden. On the positive front, the lodging and equipment were the best that we have had from the three trips. The hotels were quite nice and truly were 4 star accommodations. The bikes had cushy seats and comfortable handlebars. Even the panniers were a step up with easy snap on and off functionality and very good water proofing. We enjoyed the trip and it was high quality as we have enjoyed with Tripsite. The scenery just wasn't as nice and that's why we rank this as our least favorite of our trips so far. Have no fear, we will go again next year and are already looking at the Barcelona/Girona trip. We love working with Tripsite and will be long-term customers! I fully enjoyed the Lorraine/Moselle bike trip (May 14-20, 2016) with the staff of La Belle Fleur. This was my first bike and barge trip and it certainly was a stress free and relaxing way to see the region. The owner/operators of the boat (Sander and Els) were not only very professional, but charming, enthusiastic, and helpful. Els was also a superb cook so our meals were always delicious. Pieter was the perfect guide (and quite the character! ), fun to bike with, patient, knowledgeable of the route and the potential sights, and willing to change the agenda to meet the interests of his clients. The pace was leisurely and we had ample time to view both the valley scenery and the grand old cities along the route. The bikes were in good repair and suitable for the mostly level countryside we were traversing. Another delightful aspect of the trip was that the route was mostly off the busy roads and on dedicated bicycle paths (except, of course, in the cities). The weather, though often cloudy and brisk with occasional light sprinkles of rain, was never a problem. The passengers got along well together and we had fun evenings relaxing aboard ship along with the crew. One week of biking seemed just the right amount of time. I came home with many wonderful memories of people, places, and experiences. I can highly recommend this trip and this boat company. The folks at the Tripsite office in the U.S. were also very responsive and easy to work with so they get my "thumbs up" award too! Bicycling Passau to Vienna with the MS Normandie was a great experience. The bicycle route was mostly flat and in top condition. The views along the way were scenic and enjoyable. The small villages were charming and the larger cities were very beautiful. Our accommodations and meals on the boat were wonderful. One of my favorite experiences of the week was the optional trip to the opera house in Vienna. I am especially glad I didn't miss it. This was my third Tripsite tour and overall this adventure was everything and more that I had hoped for. I would highly recommend it to anyone that loves cycling. I think it is suitable for all skill levels. I will say that on this tour the guides daily instructions were minimal. His input was very basic and quite a disappointment compared to past guides. No photo slide show with instructions such as, "when you see this landmark or sign be sure to turn here." The guide books with maps that were provided were of great assistance, however, and we were able to compensate for the most part by carefully following these written instructions. There was also a small tourist guide book in each room from which you could read about points of interest in each city and village along the way. As I said, overall this was a fantastic week and my friend and I loved every minute! We meat along the tour in all hotels you reserved for us a very nice attitude from the owners and/or staff and we received a remarkable co-operation and hospitality. We would like to compliment you for your choices. You would love both the wine and beer and probably the food too, Keith. And the wonderful bike trail connecting them all makes it paradise on earth. I highly recommend this incredible bike tour!! Great photos of the scenery and the food! I normally like Italy, but you've convinced me to travel farther north! If you arrive in Remagen by train (highly recommended) you are literally a few footsteps away from your hotel. This is convenient for your arrival & departure as well as for a couple of the side trips. The train serves both the Rhine Valley and the Ahr Valley. They are both great for bicycle tours, but the Ahr Valley is an absolute must. It is so calm & peaceful yet filled with incredible scenic, historic & gastronomic stops. The owner of your hotel also serves as your tour-guide if you visit the Ahr Valley wine museum. And the Ahr Valley bike path is one of Germany's greatest hidden gems. This bike tour had it all: great scenery, wonderful food, delicious wine and the perfect itinerary. The rental bike was fantastic, the accommodations were comfortable, the luggage shuttle was reliable & the guidebook was helpful/informative. I was surprised at how much there was to do and see along the way. Each town was interesting & historically fascinating. Touring this region by bicycle is the only way to go. It allows you to stop in each village/town along the way to sample the food & explore the sites. The guidebook that is provided with your tour is quite helpful; but I encourage you to stop in as many towns as possible, even if they aren't listed in the book. 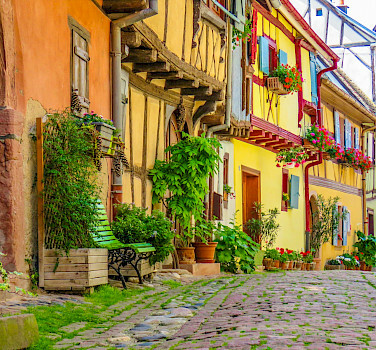 You'll be surprised at the hidden charms you will discover on some of the side roads. The bicycle route (mostly bike paths) can be found on either side of the Mosel River. And, in most cases, you can't go wrong. Once again, the guidebook provides suggestions for which side to choose. But either side is fascinating. And since the vast majority of the route is car-free, you feel safe and free to watch the scenery rather than the traffic. I hope to go back sometime and explore the places I missed on my first tour.